Just how many accessible Hobbit holes is there in Hobbiton? 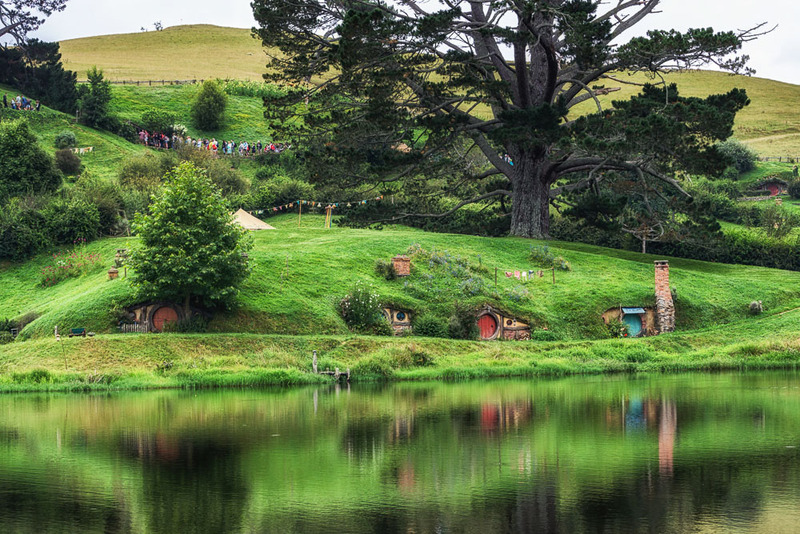 Hobbiton is one of New Zealand’s biggest tourist drawcards, but behind The Lord of the Rings film sets are some truly stranger-than-fiction facts. 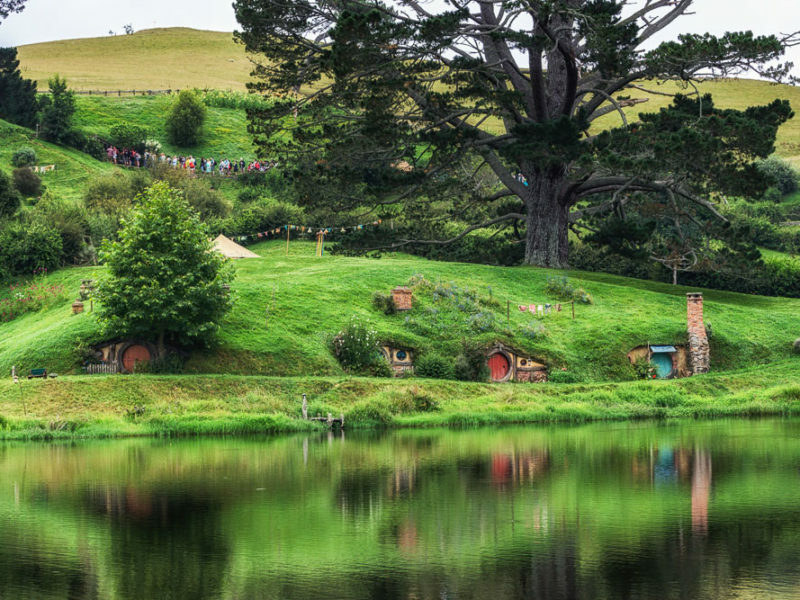 A visit to New Zealand’s North Island wouldn’t be complete without a tour of Hobbiton, but all is not as it seems behind the scenes of one of Hollywood’s most successful film trilogies. You’ll discover the infamous Hobbiton fake tree, how Peter Jackson tricked the cast into thinking they were allowed to really get drunk while filming Bilbo’s birthday scene and how you can tell Bilbo was one of the richest hobbits in Hobbiton. Hobbiton Movie Set has 44 houses (or holes) in total, but most are just façades. There’s only one that tourists can go in to. And guess what? It’s not Bag End (Bilbo’s house). Hobbiton at sunset is a sight to behold. Image Tourism New Zealand. The frogs in this part of the North Island were so loud during filming that at times the actors couldn’t hear each other. Director Peter Jackson had the amphibious creatures collected to avoid disrupting the filming further. They were reintroduced afterwards. A person was employed to walk between the clothes lines on top of the Hobbit houses for a couple of weeks just to make the track look well worn. Besides a two-hour tour, the venues at Hobbiton are available for functions, including weddings. To date, however, there has been no Hobbit-themed matrimonial. The tree above Bag End is made from fibreglass and has silk leaves (imported from Taiwan), which had to be individually wired on over the course of weeks. On the other hand, all the fruit and veg currently growing in Hobbiton is seasonal with eight gardeners tending to it. Peter Jackson wanted Bilbo’s birthday party scene to be authentic so he let the actors drink as much as they wanted. Unbeknownst to them, Jackson supplied a special brew that was only 1 per cent alcohol (called Sobering Thought), which is still sold. Peter Jackson wanted his actors to really celebrate Bilbo’s birthday but he left out one tiny detail. Image Tourism New Zealand. In Tolkien’s book, he describes a gorgeous plum orchard. However, the plum trees in New Zealand were deemed too big, so apple and pear trees were planted. All the fruit and leaves were stripped and replaced with fake plumbs, making it the right scale. After all this work, the orchard never made it to the final cut. To be cast as a hobbit, you had to be five-foot-two and ‘round of face’. The 44 holes are built to different scales, according to the size of the actor being filmed. So the tall Gandalf stood in front of doors that are 60 per cent scale whereas the hobbits hung around ones at 90 per cent. ‘Hobbiton’ or ‘The Shire’, featured on the set of The Hobbit and the Lord of the Rings trilogy. The lower down the hill you live in Hobbiton, the poorer you are. Therefore the higher up the hill you go, the more manicured the gardens become. Bilbo is one of the richest hobbits. The detailed exterior decorations of each hole depict the occupation of the Hobbit who lives inside. You’ll find beekeepers and loggers, with the smell of fresh bread wafting as you walk past the baker’s house. Many of the mistakes made during filming ended up being included in the film. In the first movie, Gandalf accidentally hits his head in Bilbo’s house. Because actor Ian McKellen continued on with the scene so professionally, Peter Jackson decided to keep it in. In another scene, Bilbo and Gandalf are sitting facing a sunset. However, Bag End faces east so the crew had to get up early to film sunrises (seven in total). If you pay close attention to the scene in the cinema, you would have seen birds flying backwards (it’s been edited out now). During filming, apparently the local sheep didn’t look ‘authentic’ enough – because they had white faces. Black-faced sheep where deemed more sheepish and brought in to replace them. The New Zealand army built the initial set for the first The Lord of the Rings film – instead of the Kiwi government stumping up the cash. The view from inside the hobbit hole. Image Tourism New Zealand.